Flightpath is the only Aviation English course to offer a thorough grounding in the full range of communication skills needed by aviation professionals to communicate in non-routine situations. With regular focus on ICAO criteria, learners are given full support in reaching industry standards, including case studies, analysis of their own communication skills, exposure to authentic in-flight communication, and communicative tasks. Flightpath is the most accurate preparation course available for any ICAO4 language test, and includes authentic industry training video. 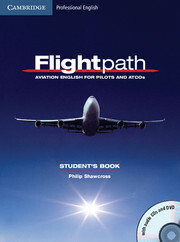 Flightpath has been reviewed and endorsed by a panel of leading aviation communication and safety professionals.